You can tell by the smell that your Dell isn't well. I've worked in retail long enough to say with confidence that when a customer comes to you with some impossibly ridiculous complaint, 99 times out of 100 they're either making it up to cover something they've done, or they're nuts. 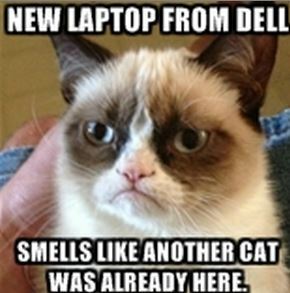 And that's probably what Dell technicians thought back in June, when an owner of a new Latitude 6430u laptop reported that "it smells as if it was assembled near a tomcat's litter box." But then other people started reporting the same thing. By mid-August, Dell Senior Technical Consultant "SteveB" got involved, saying the company hoped to have a fix shortly; but as August rolled into September it became clear that the situation was trickier than anyone expected. Customer units were sent to vendors for analysis, and while SteveB said on September 12 that "a biological contaminate/health hazard is not suspected," the cause remained a mystery. Amazingly, it took until today for Dell to come up with a fix for the problem. The company confirmed that the odor is not the result of biological contamination and poses no health hazard; it was simply a problem with the manufacturing process of the palm rest assembly, which has since been fixed. The specific cause of the smell wasn't revealed, although SteveB tweeted that he hopes to post all the details in the Dell forums either this week or next. That's not good enough for at least one owner, however, who's none too happy with Dell for causing him to yell at his cat and spend considerable bucks on "countless veterinarian bills" trying to figure out why his feline friend suddenly insisted on peeing on the computer. "Do you know what my wife and I went through because of this? How terrible we feel because we scolded a cat that did nothing wrong?" he wrote. "Turns out Jerry is as good as always, and I want Dell held accountable for this misery." Dell customers who have computers that smell like pee, and who have confirmed that they have in fact not been peed upon, may avail themselves of support options at dell.com.